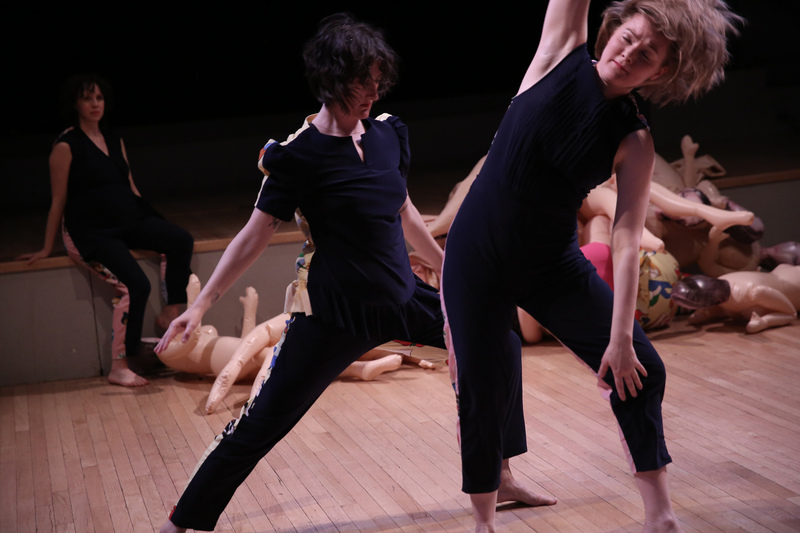 EZ Pass is the newest collaborative work of longtime dance partners and improvisers Laurie Berg and Bessie McDonough-Thayer. 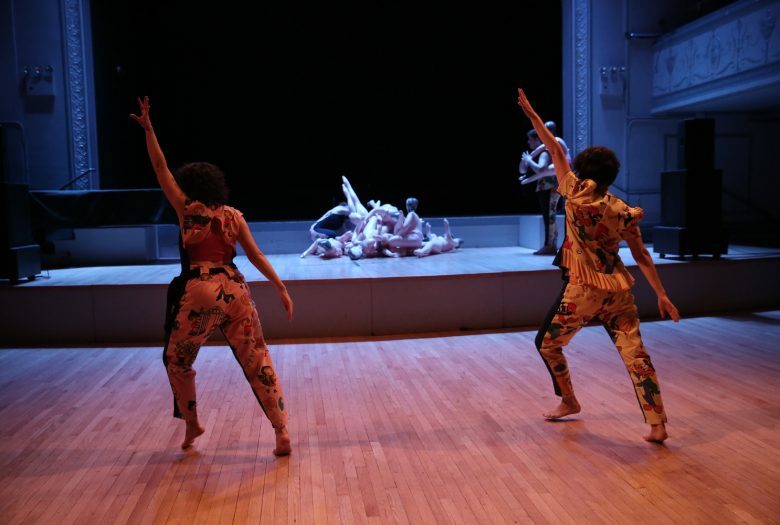 EZ Pass follows the path of least resistance, as the choreography cuts and loops around itself to reflect the added dimension of multiple pairings passing to and fro as Laurie, Bessie, and special guests perform increasingly complex displays of the choreography to comic effect. They move from object duets to human duets to object human duets, creating the space to opt in or out as relationships shift from said duets to quartets to solos to nothing at all. Your worst nightmare. Karl Scholz creates an original driving sound score, and Michael DiPietro adds beautifully crafted costumes and props. Laurie and Bessie began making work together in 2008. Their collaborative work has been shown as part of Charles Atlas Presents The Kitchen Follies, WeisAcres Sundays on Broadway, BAX Site Lines curated by Catherine Galasso, Mount Tremper Arts, Movement Research Fall Festival 2018, 303 Gallery, Dixon Place, CounterPulse San Francisco, WiM Festival, and Movement Research at the Judson Church. Bessie McDonough-Thayer is an independent dance artist living in Brooklyn. Her solo work has been shown at Roulette, Danspace Project’s Food for Thought curated by Stacy Szymaszek, CPR New Voices in Live Performance Series, AUNTS at Arts@Renaissance, AUNTS PS122 Launch Party, Movement Research at Judson Church, and BRINK at Dixon Place. Most recently, she was the recipient of a Movement Research GPS grant for a 2-week residency program at ZIL Culture Center in Moscow, Russia. As a performer, she has worked with Jen Rosenblit, Sam Kim, Elena Demyanenko, Rebecca Brooks, Kat Galasso, Diana Crum, Vanessa Anspaugh, Molly Poerstel, Emily Wexler, Laurie Berg, and robbinschilds. Laurie Berg makes work in a variety of forms including dance, performance, collage and jewelry. She is co-organizer of AUNTS, co-curated the Movement Research Spring Festival 2017, was the 2016 recipient of “The Tommy” Award and a 2016-17 LMCC Workspace Artist-In-Residence. Recent works include scape: Times Square (co-commission by Times Square Arts and Danspace Project), Terrifying Times Call For Terrifying Jewelry (Dixon Place) The Mineralogy of Objects (Danspace Project). Her jewelry, which plays with the juxtaposition of real and fake, new and old, precious and plastic, can be seen around the necks of many dance artists in NYC. Jodi Bender is a dancer/performer based in New York since 2003. Since 2012 she has worked intensively on several projects with Laurie Berg, Vicky Shick and David Thomson. She has also performed in work by Rebecca Brooks, Rebecca Davis, K.J. Holmes, Sam Kim, Jillian Sweeney and Tara O’Con among others. Jodi has shown her own work at Mondays at Roulette, THROW at The Chocolate Factory Theater, AUNTS, the Flic-Fest After-Hours Cabaret at Irondale and at Luis Lara’s Not Festival. Anna Adams Stark is a performer and arts administrator based in NYC. She hails from Normal, IL and has a BFA in Dance from the University of Iowa. Anna has performed in work by the A.O. 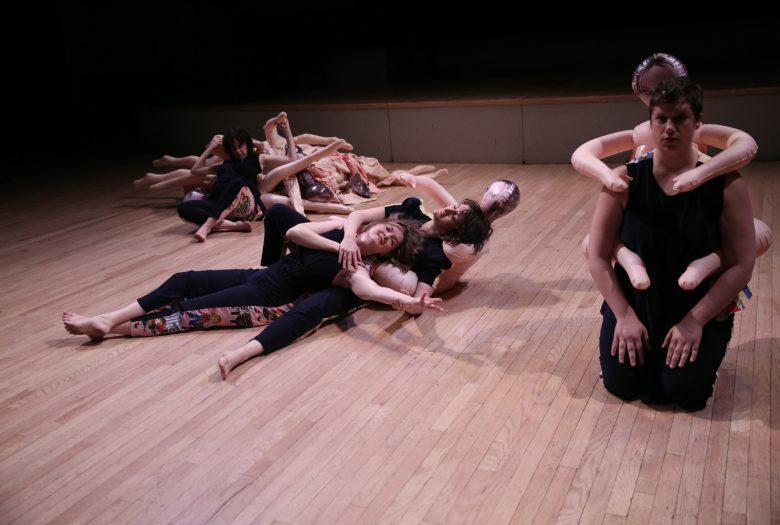 Movement Collective, Ivy Baldwin Dance, Laurie Berg, Levi Gonzalez, Tara Aisha Willis, Lindsey Dietz Marchant, Megan V. Sprenger/MVworks, Alexandra Beller, among others. Currently, Anna is working with Kim Brandt, Laurie Berg & Bessie McDonough-Thayer and Kendra Portier/BANDportier. Anna has been on staff at Movement Research since 2014. She is grateful for this time spent with Laurie, Bessie, Jodi, Karl and Michael. Michael DiPietro is a visual artist and designer. His work has been presented in collaboration with the performance community in New York including AUNTS (Mount Tremper Arts Summer 2015 Festival, Arts@Renaissance), chashama, Flux Factory, Movement Research (2017 Spring Festival), Silent Barn and Triskelion Arts; and has been supported with residencies through AUNTS, the Ace Hotel, and chashama. He has designed costumes and visuals for dance works by Jillian Sweeney, Clarinda Mac Low, and most recently Laurie Berg and Bessie McDonough-Thayer. He holds a BFA in Integrated Design from Parsons the New School for Design. Karl Scholz is a musician, sound designer, creative software developer, and interdisciplinary artist living in Brooklyn. He has made music for several of Laurie Berg’s pieces and his work has been heard at the Whitney, The Kitchen, Danspace, the New Museum, the Pulitzer Museum, Trouw Amsterdam, Rubulad, the House of Yes, and many others. Additionally, Scholz develops and releases creative tools and toys through his company Bolasol, is an avid rollerskater, and aspires to someday make a timeless party jam. 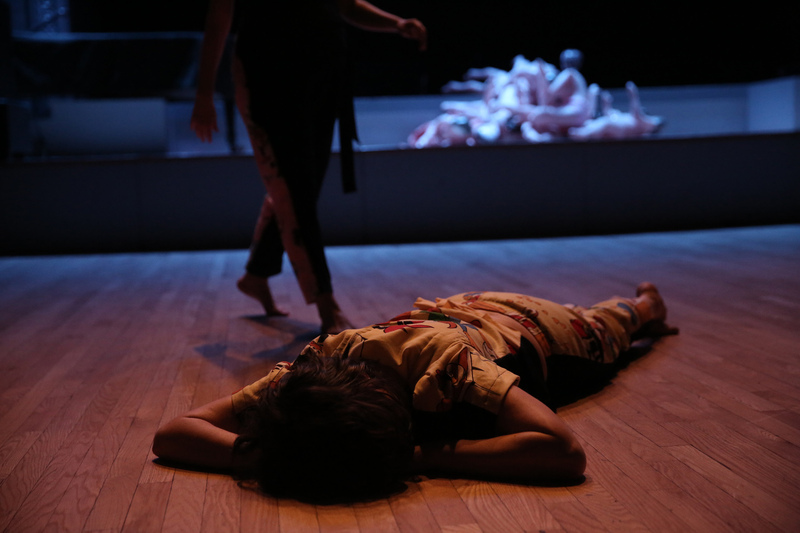 Laurie Berg & Bessie McDonough-Thayer: EZ Pass is presented as part of DANCEROULETTE and is supported, in part, by the Mertz Gilmore Foundation, the Harkness Foundation for Dance, the National Endowment for the Arts, and the New York City Department of Cultural Affairs. EZ Pass was funded in part by an Foundation for Contemporary Arts Emergency Grant.